1965: Aero Commander Div of Rockwell Standard Corp (fdr: Willard Rockwell); acquired rights to Snow S-2. 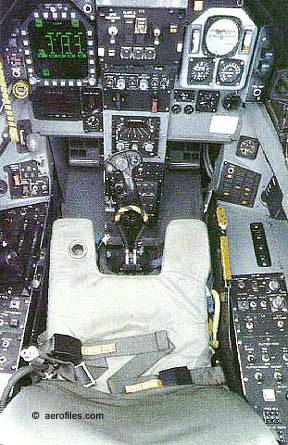 7/12/65: Acquired rights and tooling to Volaircraft and Meyers 200; Albany GA. 1967: Rockwell Standard merger with North American Corp as North American Rockwell/Rockwell Commander Inc. 197? : General Aviation Div, North American Rockwell. 19?? : Rockwell Intl, Bethany OK. 19?? : Columbus Aircraft Div, Columbus OH. 19?? : (Fred) Ayers Corp, 1 Rockwell Ave, Albany GA.
B-1 Lancer - Intercontinental strategic bomber. 4pClwM rg; four 30780# F101-GE-102 turbofans; span: (open) 136'9" (swept) 78'3" length: 147'0" (?>143'4") v: subsonic to supersonic (M2.2/M.85/x) range: 6000+. Gross wt: 380,000#, max wt: 477,000#. Stealth-type technology, variable wings. Program cancelled June 1977, then revived Oct 1981. B-1A 1974 = ff: 12/23/74. POP: 4 prototypes. B-1B 1984 = Modified to low-altitude, limited supersonic using radar-absorbent construction materials. Three weapons bays for 75,000# bomb load; load: 285,000# range: 7455; ff: 9/x/84. First unit delivered to USAF in Apr 1988. POP: 100 up to 1988. 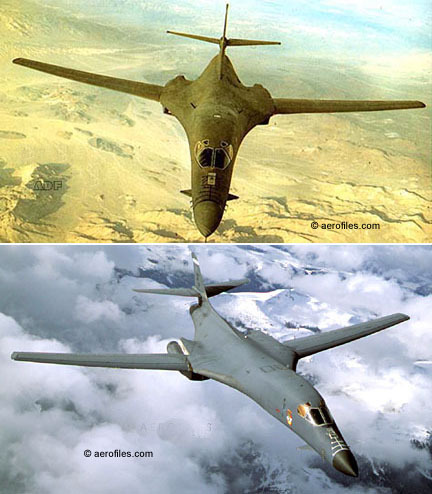 Originally conceived as a nuclear bomber, with the end of the Cold War the USAF instituted the B-1B Conventional Mission Upgrade program, which involved Block C (1997), capability to drop cluster bombs; Block D (1999), deployment of JDAM, new defensive system, new navigation and communications systems including the fitting of GPS (global positioning) systems to enable the dropping of satellite-guided munitions such as JDAM, and an AN/ALE-50 towed decoy system (c.2003); and Block E (scheduled for 2002), capability to deploy JSOW (Joint Standoff Weapon) and Wind Compensated Munitions (WCM). The Joint Air to Surface Standoff Missiles (JASSM) is to enter low rate initial production in 2002 and will be deployed later. C-130U 1990 = Conversion of new Lockheed C-130Hs as close air support gunship. 13pChwM rg; four Allison T56-A-15 turboprops; span: 132'7" length: 97'9". Armed with fire-controlled 25mm, 40mm, and 105mm guns. POP: 12 as AC-130U. Commander 111, 112A 1972 = Evolution of Aero Commander/Gulfstream Commadner. 4pClwM; two 200hp Lycoming IO-360C; span: 32'9" (?>;32'11") length: 24'11" load: 956# v: 171/161/62 (?>150/142/x) range: 975 (?>1010-1180) ceiling: 13,900; ff (111): 9/11/71 (112 with 180HP O-360-A1G6); 12/4/70. Model 111 with constant-speed prop. Commander 114 1976 = 260hp Lycoming IO-540-T4B5D; load: 1235#�v: x/157/x. $33,000; POP: ??. Commander 212 1970 = 2pClwM rg; 180hp Lycoming 0-360-AID; v: 170 range: 1200; ff: 12/4/71. FV-12 1977 = USN supersonic V/STOL fighter with 16000# P&W YF401-PW-400; span: 28'6" length: 43'11" v (projected): Mach 2+. Empty wt: 16550#. For economy, 35% of its structure came from existing aircraft (A-4, F-4, et al). 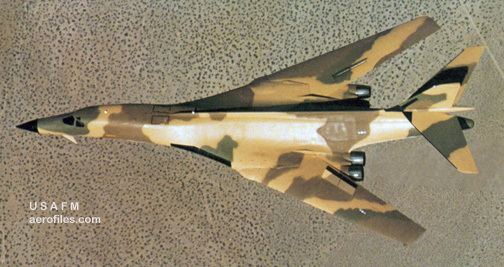 Its unique Thrust Augmented Wing device was designed to run ducted air to a full-span ejector flap system in the wings and the canard ducting system to create boundary layer control similar to the blown-flap design of RA-5C. USN contract awarded in 1972. 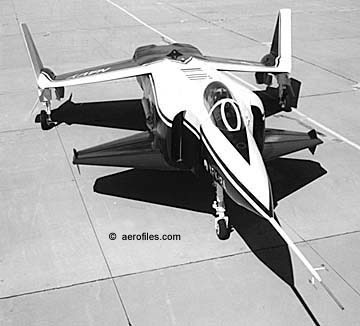 POP: 1 prototype as XFV-12A did not fly beyond hover testing at NASA. Jetprop Commander - Turbopowered evolution of Commander with winglets, redesigned engine nacelles. 840 198? = Panorama cabin windows. 1000 1980 = Same engines as 980 but 8-11p with redesigned, expanded cabin with individual windows; span 52'2" length: 43'0" load: 6968# v: x/333/x range: 2300. T-2 Buckeye 1958 = USN/USMC carrier-capable intermediate jet trainer. 2pClwM rg; two GE 085-GE-4 turbojets; span: 38'2" length: 38'8" load: 5065# v: 520 range: 910 ceiling: 44,400'; ff (North American prototype):1/x/58 (T-2C) 4/x/68. 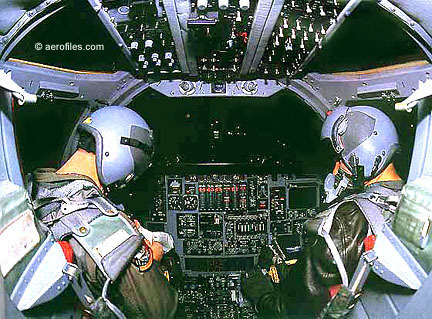 Ejection seats. Originally designed for a single engine, it used the same wing as FJ-1. POP: ?? as T-2C, replaced by T-45. SEE ALSO North American. X-30 - NASA project NASP (National Aero-Space Plane) to operate from conventional runways to space and return at speeds more than Mach 5.0. X-31 1990 = 1pClwM; GE F404. Collaborative effort with Messerschmitt-Bolkow-Blohm in Germany in the supersonic, high angle-of-attack X-aircraft program to develop a fighter for flight testing. 1pClwM rg; GE F404; span: 23.10" length: 43'4" load: 4525# v: Mach 1.3; ff:10/11/90 (p: Ken Dyson). 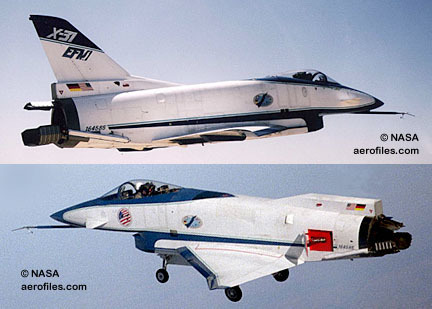 POP: 2 for USN as X-31A [164584/164585], the first destroyed in a crash 1/19/95.